Good attendance at school is important for academic progress, social interaction with peers and the opportunity to participate in clubs and try new activities. Academic studies have shown a direct link between attendance and progress towards GCSE grades. 19 days of school missed per year (attendance of 90%) equals one GCSE grade dropped on average. Excellent attendance is proven to be a substantial and fundamental factor in every student's chances of achieving success in school. Regular and punctual attendance not only ensures the continuity of and access to substantive teaching and learning, but minimises disruption to individual lessons and collective programmes of study. What Do The Attendance %'s Mean? If a student does not attend school or is not taking part in an approved educational activity, they are classed as absent from school. This means that if your child is off school for any reason, even if they are ill or have medical permission to be off school, they are classed as absent. Less than 95% attendance every year in school equals one GCSE grade dropped on average. Consequently, we expect all our students to aim for 96% attendance or above. Additionally, this is useful preparation for the workplace, where an absence rate of 5% or above would be considered a cause for concern. **Research suggests that 17 missed school days a year = 1 GCSE grade drop across ALL subjects. At The County High School, Leftwich we are committed to sustained, high year-on-year attendance and we believe students and parents/carers can make a significant contribution to this objective in close and mutually supportive partnership with school. The strategy created has been developed to help strengthen the link between all groups through improved communication. Our parents and carers are key facilitators in ensuring students are encouraged to have strong attendance and punctuality. The importance of your role cannot be overstated. Electronic registration enables our staff at all levels to contribute to a culture that is responsive to and rewards positive attendance. More importantly, accurate registration information provides an early warning system for use in intervention and support for those students and families for whom poor attendance is an emerging or ongoing problem. We have a legal responsibility to complete formal registrations for the morning and afternoon session of school, in order to meet statutory responsibilities to parents/carers and other agencies in providing accurate punctuality information about individual students and school cohorts. We ask you to contact the Pastoral Office directly (01606 333313) to explain a student's absence. We kindly request you do this before the start of the school day at 8:45am. Attendance and punctuality are rewarded every two weeks. Those students who have managed two weeks of full attendance with no lates are placed into a Year Leader draw. Students can win various prizes as a result of their excellent attendance and punctuality. Half termly, termly and yearly 100% attendance is celebrated and students will receive a certificate as acknowledgment of this. Contact school on the first day of absence to provide a reason for non-attendance. Request leave of absence in term time for exceptional circumstance by completing a form. Work with the school and any other agency to resolve any difficulties which may affect regular school attendance. At the County High School, Leftwich, we do not expect holidays to be taken in term time as this has an impact on students' progress. Leave of absence can be requested in exceptional circumstances. For further information or to request leave of absence please contact the Pastoral Office. 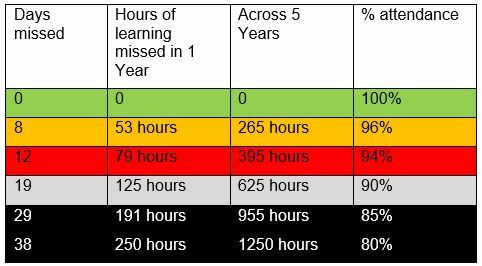 Lateness to school has a negative contribution towards student progress and is something that we take extremely seriously at The County High School, Leftwich. Through 'InTouch' and progress reports you will be provided with your son/ daughter's punctuality data throughout the year. The aim of this system is to keep parents/ carers well informed on when their son/ daughter is late, and further strengthen the links between home and school. Similarly to attendance, punctuality is important in learning and progress for students and over time can have a detrimental effect on the results your son/daughter achieves. "The school forms strong links with primary schools and establishes particularly positive relationships with pupils in Years 5 and 6…Older pupils support new arrivals; they are keen to care and nurture them into school."